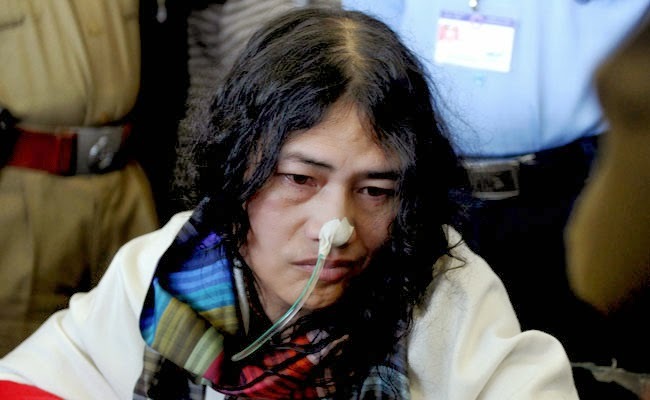 Fasting Manipur activist Irom Sharmila was on Thursday set free by the court of the Chief Judicial Magistrate, Imphal Central, in a case of suicide attempt. Immediately thereafter, she resumed her fast, a protest she began on November 4, 2000 demanding repeal of the Armed Forces (Special Powers) Act, 1958. Law permits authorities to detain her for one year in one go. All these years she has been released at the end of one year of detention. Ms. Sharmila was concerned over increasing massacres of innocent people by security personnel long after insurgents had escaped after ambuscades. For her, the last straw was the killing of 10 persons including a woman on November 2, 2000 at Mallom near Imphal, long after the escape of militants who detonated a bomb. However, the Manipur and Central governments have refused to concede her demand, saying repeal the AFSPA would amount to giving the foreign-trained militants carte blanche. On Thursday, soon after she was released by the court in Imphal East district, the activist resumed her fast inside the shed where activists of the Save Sharmila Organisation have been assembling every now and then to extend her moral support. Police sources said she would be arrested shortly for continuing the fast. A court in Delhi had ordered her to appear on March 30 on the charge that she tried to commit suicide by staging a fast there.